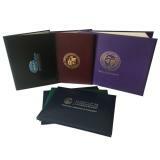 There is 3 standard layouts diploma cover for your options. 1. Tent style is top long edge fold. 2. The panoramic style also called landscape style, which is opened horizontally. 3. 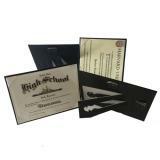 Book fold is just like a book, it can show your valued diploma vertically. 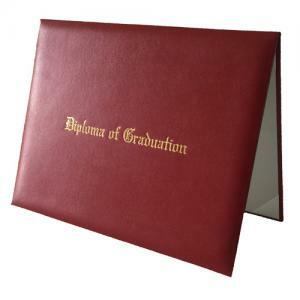 We manufacture numerous sizes of diploma holder to fit different sizes certificate, such as 4"x6", 5"x7", 6"x8", 7"x9", 8"x10", 8.5"x11", 11"x14", A4 and customs sizes also available. 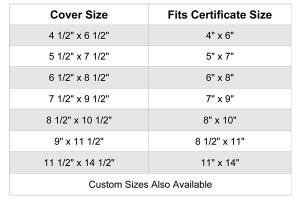 For a better understanding, you can view the chart below to see the cover sizes with their fitting diploma size. 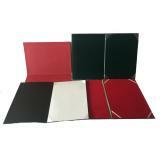 The diploma folders can be made from leatherette, leather, vinyl and linen paper in different colors and textures. 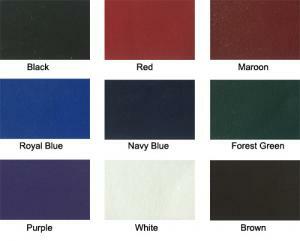 Just check on Color Swatches of our stock textured leatherette below to get what you want. 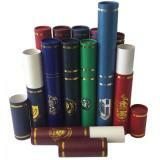 Custom colors can also be produced on your requirement. 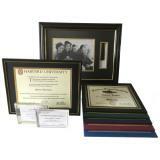 A single or double frame line can be debossed on the front and back of your diploma cases. 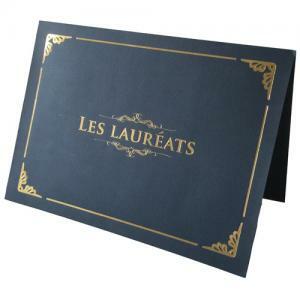 Your diploma covers can be imprinted in gold foil stamping, silver foil stamping, blind deboss and full color silk screen printing. 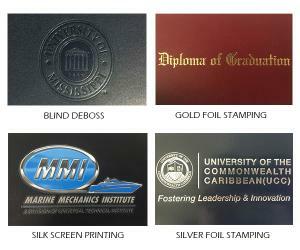 For your graduation covers we have various inside panel options. 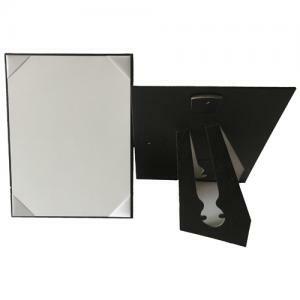 Double white cardboard panels will be taken as basic and fundamental use. 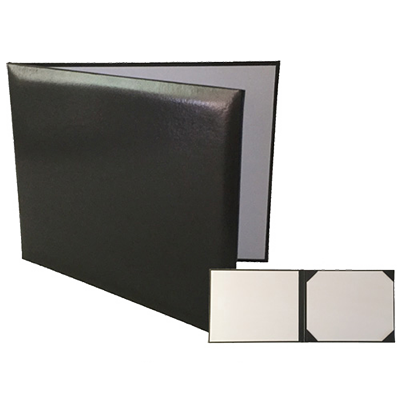 You can also choose to use one moiré panel or double-sided moiré panels for a higher grade quality. 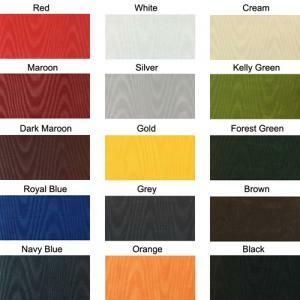 We stock moiré panels in economy white, regular white, deluxe white and gold for your choices. Other colors can be provided by demand-oriented. 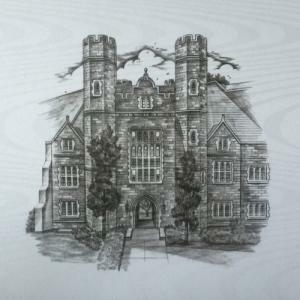 Personalized etchings on the interior panel of certificate covers can be supplied. Imprinted moiré fabric, print 1 color or full colors images. 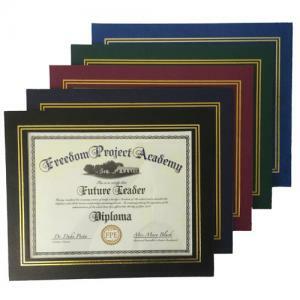 For your certificate holders corner ribbons are available in many colors. 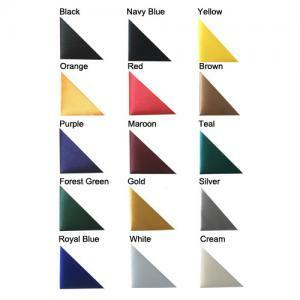 We offer 4 ribbon corners for one diploma and 8 ribbon corners for double certificate, please kindly click on the Ribbon Colors Swatch below to see the different colors. 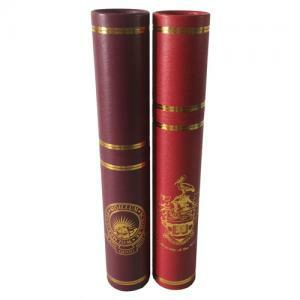 Hangzhou Shengzhong Covers Co., Ltd. is a leading manufacturer in custom-made diploma cover industry with a wide selection of materials and colors. 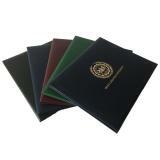 As a professional team with more than 20 years experience in recognizing graduates achievement. We are proud of offering premium quality products with extremely affordable price at the fastest delivery time to our customers. Make us your single source supplier for school diploma covers, padded certificate covers, graduation certificate holders, diploma frames, certificate scrolls holder, autograph albums and more. 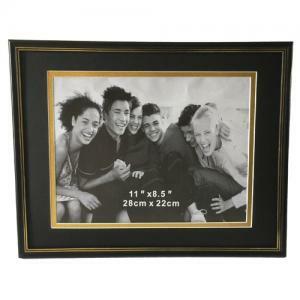 You will gain not only factory direct price, but also friendly and considerate customer service.